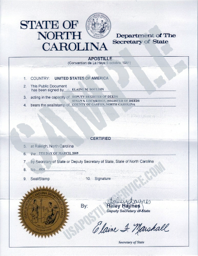 Transcripts, report cards and diplomas issued by a North Carolina university, college, community college or high school must be notarized by a North Carolina Notary Public. A school seal applied to the document by the school registrar is not acceptable. Apostilles may be issued for a certified copy of a public document. Apostilles neither applies to documents executed by diplomatic or consular agents nor to administrative documents dealing directly with commercial or customs operations (e.g., certificates of origin or import or export licenses). Documents must have original signatures only. Documents must be current, preferably issued within the last 1 or 2 years. State issued certified documents should be current as of April 2000. 7)the acknowledgement must be in English. 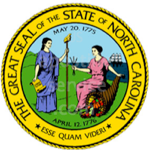 If a document is presented in a language other than English the NC Secretary of State’s Office will require a certified or notarized English translation.